Are you going to push and praise your way through? Ultimate success is fulfilling the purpose of God, for your life. This doesn’t come easy. You cry through it, pray through it, and want to quit through it. Yet, everyday that you wake up, you have to make a choice. Are you going to do it all over again? Are you going to do what God told you to do? Are you going to answer the call and will you praise Him in the midst of it? Are you willing to push and praise? You don’t come to a place of having what you want because it fell in your lap. For every good marriage, there were hundreds of hours spent toiling, fighting within, and praying for change to come. For ever healthy life, there were months and years of mistakes and unhealthy habits. For ever goal achieved, there were times of learning what not to do, so that the “what to do” was engrained on the heart of the achieved. I know these things from experience. When you want to be successful in life, you worry, but then at some point you realize that worrying isn’t going to get you anywhere, so you seek to do something else. As children of God, we have to look to Him for our answer and, as we have seen before, He has a word for every situation that we find ourselves in. Don’t worry! But what do you do when you are full of worry? You are worried about your house, your finances, your marriage, your personal success, your friendships…so full of worry. And all of this worrying is making you anxious. You have to be willing to do what the Word of God says. You open up your mouth or stop for a moment and commit to action. You must not give up! No matter how you are feeling. You must know without a shadow of doubt that whatever God has called you to do, He will also equip and accompany you to do. You must push your way through this and every situation in front of you. You must get in the word of God and reinforce the words that He spoke to your heart from the beginning. Get to a place where you know that you know that God has called you to this place of pushing to the high mark that He called you to. Put on the playlist. If you don’t know what to play, go on YouTube and pick your favorite biblical song. From there, the app will do the rest, playing songs that are like it. Allow the Holy Spirit to encourage and be with you through this process. Tell your heart to be glad. Find the beauty and the joy in the midst of the situation. Don’t allow yourself to get in a slum. Yes, cry, if you must, but then be done with it. Give it to God and praise your way through, knowing that He is faithful and He is with you. 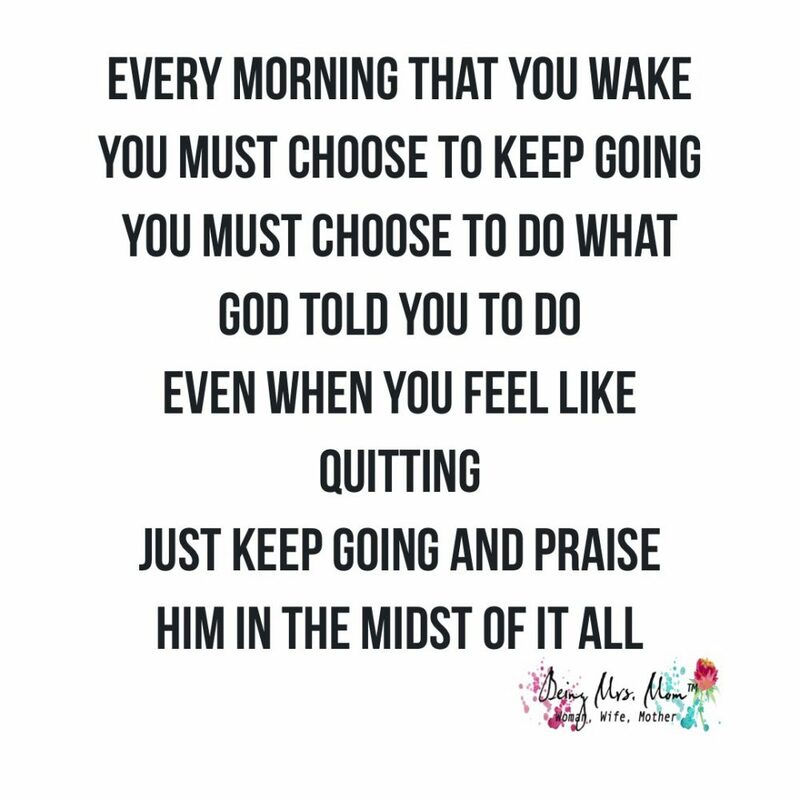 For everyday that you wake up, He has something for you to do. For every breath that you breathe, there is a task for you to accomplish. For every moment that He graces you with, He is with you spurring you on to accomplish the thing that He has placed in your heart. So, dream big for your marriage. Have high hopes for your children. Determine that the dreams and visions that He has placed in you, will come to pass because you are going to allow the Lord to work in you and through you, to see them accomplished. Make a decision, everyday not to give up, so that have the strength to push and praise. If you are struggling with seeing things in a positive light and need a little push from the outside, make sure to subscribe to my newsletter. You will receive encouragement, right where you are. 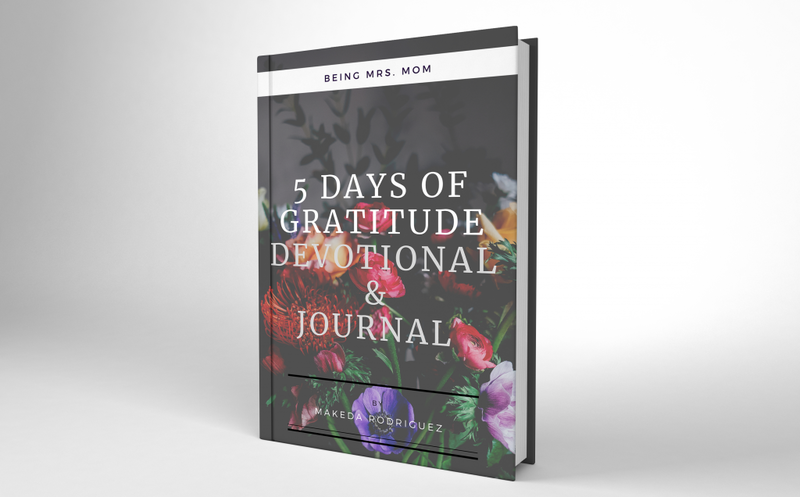 If you need to take a few days to refocus, so that your heart can get right, then go ahead and purchase the 5 Days of Gratitude Devotional and Journal. You’ll be encouraged through the Word of God to refocus and live life with a thankful heart.